My first book was recently published via VDM Verlag. Thanks to Gabriel Caruntu for hooking me up with them. If you're interested in buying please click here, it's only $116(!). 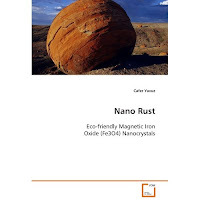 This work describes the first size dependent magneticseparation in nanoscale by using rust like iron oxide. Magnetite (Fe3O4) nanocrystals of high quality and uniform size (4 nm to 33 nm) were synthesized. Batch synthesis was shown to go up to 20 grams which is more than 10 times of a standard nanocrystal synthesis, without loosing the quality and monodispersity. Reactor design for mass (1 gram per hour) production of magnetite nanocrystals isreported for the first time. A green synthesis thatutilizes rust and edible oils was developed. The cost of a kg of magnetite nanocrystals was brought down from $2600 to $22. Size dependency of magnetism was shown in nanoscale for the first time. Reversible aggregation theory was developed to explain the low field magnetic separation and solution behavior of magnetite nanocrystals. Arsenic was removed from drinking water with magnetite nanocrystals 200 times better than commercial adsorbents. Silica coating was successfully applied and magnetite - silica nanoshells were functionalized with amino groups. For the first time, silver was coated on the magnetite -silica nanoshells to produce triple multishells.